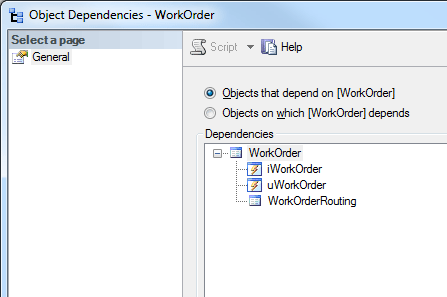 T-SQL - How to list sql server table dependencies using T-SQL? Home » T-SQL » How to list sql server table dependencies using T-SQL? How to list sql server table dependencies using T-SQL? You can always use SQL Server Management Studio, just right click on a table in object explorer and select View Dependencies. However this way doesn't give you ability to copy dependencies to clipboard or any other way to export dependencies list. Luckily you can find the same data using SysObjects and SysDepends tables. Here is a quick T-SQL snippet that you might want to use for this purpose. Re: How to list sql server table dependencies using T-SQL?